We have been spared the worst of Hurricane Florence and now our attention turns to helping our neighbors to the south and west. The Outer Banks is in great shape and we look forward to an amazing upcoming fall season. In order to help those in need in other areas of North and South Carolina, we are donating a portion of revenue from reservations taken between September 15th and October 19th of this year to Hurricane Disaster Relief. All remaining 2018 weeks and any 2019 weeks count towards our giving goal. We know how lucky we were to have avoided the destruction that Florence has brought to our neighbors and want to help those communities get back on thier feet. Call (888) 853-7770 or search here on our website to make your next OBX vacation reservation this month and help us give to those in need! Beginning today, September 15th at 2:30 pm, Priority Levels Two and Three will be allowed to access Hatteras Island. That's residents, property owners and workers. Hatteras Island VISITORS will be allowed access beginning Sunday, September 16th at 3:00 pm. As previously mentioned, visitors are able to access the areas north of Oregon Inlet tomorrow at 7 am, and now those needing to get south of Oregon Inlet will be allowed to continue on starting at 3 pm. Travel safely! We're back at work this morning and it's a busy day! Many of our staff are just returning home and we have lots to do so we're ready to welcome our guests. The Outer Banks will be open to vacationers beginning Sunday, September 16 at 7:00 am, for all areas north of Oregon Inlet only. Hatteras Island access remains closed until the required assessment of the Bonner Bridge, which is scheduled for today. Our beaches look amazing and businesses are opening back up, so plan on heading here tomorrow! Carova, Corolla, Duck, Southern Shores, Kitty Hawk, Kill Devil Hills or Nags Head - we will see you tomorrow! Rodanthe, Waves, Salvo, Avon, Buxton, Frisco or Hatteras Village, please await additional updates as travel conditions are assessed and approved for access to the island. Full details can be found on the Dare and Currituck County web sites. The beach is in great shape and it's going to be a fantastic week! Everyone is looking forward to welcoming vacationers back. 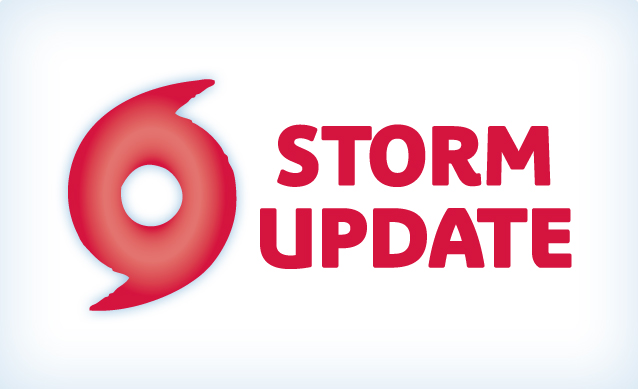 Our area remains under a Hurricane Warning and a Storm Surge Warning that officials anticipate will remain in place through late today or Saturday due to the slow movement of Hurricane Florence. Based on the warnings currently in place, reentry for areas north of Oregon Inlet will begin on Saturday, September 15 at 7:00 a.m to include Priorities Two and Three. This includes permanent residents, essential personnel for critical businesses, non resident property owners and non resident employees of non critical businesses. Priority One essential personnel with passes issued by Dare County and Currituck County Emergency Management are already being allowed entry. Sign up to receive alerts directly from Dare County Emergency Management at www.darenc.com/emergencyalerts or Currituck County Emergency Management at co.currituck.nc.us/currituck-alert/. Visit www.darenc.com/reentry for details on the staged reentry process. Those traveling to Dare County or the Currituck Outer Banks should check road conditions for travel routes due to impacts being experienced in many areas south and west of the Outer Banks. There are currently no restrictions for entering or leaving the county. Beginning at 8:30 a.m. on Thursday, September 13 only essential personnel with a Priority One pass issued by Dare County or Currituck County Emergency Management will be allowed entry. The Dare County Emergency Operations Center is activated and can be reached at 252.475.5655. Visit www.darenc.com for updated information. To receive notifications directly from Dare County Emergency Management, visit www.darenc.com/emergencyalerts and follow @DareCountyEM on Twitter. A Storm Surge Watch has been issued for the east coast of the United States from Edisto Beach, South Carolina northward to the North Carolina-Virginia border, including the Pamlico and Albemarle Sounds. A Hurricane Watch has been issued for the east coast of the United States from Edisto Beach, South Carolina, northward to the North Carolina-Virginia border, including the Pamlico and Albemarle Sounds. A watch is typically issued 48 hours before the anticipated first occurrence of tropical-storm-force winds, conditions that make outside preparations difficult or dangerous. The Dare County Outer Banks remains under a mandatory evacuation of all residents and guests, with the Currituck County Outer Banks has also called for a mandatory evacuation of residents and visitors from Corolla and Carova. Additional information will be provided as it becomes available. A mandatory evacuation for residents and visitors in other areas of Dare County goes into effect beginning Tuesday, September 11 at 7:00 a.m. This includes the towns of Duck, Southern Shores, Kitty Hawk, Kill Devil Hills, Nags Head, Manteo; Roanoke Island; and the Dare County mainland. Currituck County is also under mandatory evacuation of visitors for Corolla and Carova, beginning at 7 am Tuesday. More details will follow for guests currently in house, and those expected to arrive this coming weekend.